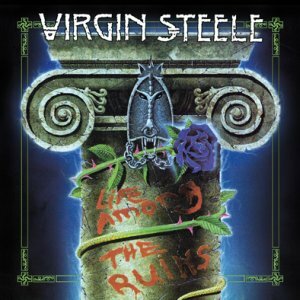 VIRGIN STEELE - LIFE AMONG THE RUINS RE-RELEASE (2CD DIGI) | Online Shop | Wizard LTD. Album: "LIFE AMONG THE RUINS RE-RELEASE (2CD DIGI)"
SPV / Steamhammer is proud to re-release Virgin Steeleґs "Life Among The Ruins". This 2 CD digipak re-release comes with massive bonus tracks and a huge booklet with new liner notes and unseen photos by David DeFeis. Life Among the Ruins was the fifth full length studio album by US heavy metal band Virgin Steele. It was originally released in 1993 and it`s the first album with bassist Rob DeMartino, who replaced Joe O&apos;Reilly, retired from the scene. "We will shortly be re-releasing our LIFE AMONG THE RUINS album. This 2012 version will be in digi-pak form and contain not one...but 2 discs with a large amount of extra ingredients. On the first disc we include 5 rare & unvarnished acoustic recordings, plus a full band bonus track. On disc #2 we have included 20 tracks. These tracks consist of a large amount of newly recorded material completed just this week, as well as alternate mixes of some of the album&apos;s original tracks. And in addition we have also included a never released track from somewhere around that period of time. All the material has been re-mastered, and the package will feature copious liner notes, photos and unique packaging....!"